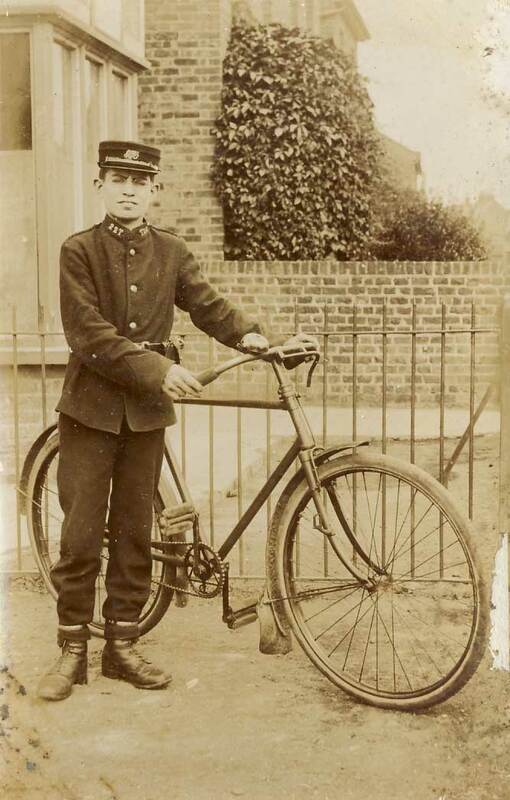 Throughout today I will be adding more postcards and vintage photographs to my website. Please check the site’s RSS Feed for more details. “We are now on our way from Luxor to Asswan by little steamer. Having a marvellous time. Coming home via Naples and Rome. We enjoyed our trip immensely on Rawalpindi. The weather here is perfect. 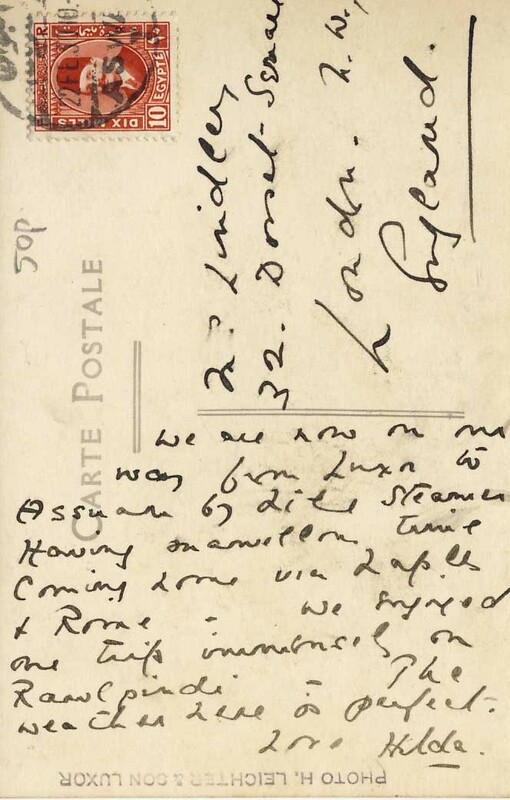 This postcard was sent to Mrs Lindley, 32 Dorset Square, London NW on 22 February 1930 – 81 years ago bar a couple of weeks. Somehow, I don’t think postcards such as this will be sent from Egypt in a couple of weeks time. Sadly, as I have just been reminded by a tweet from @britishabroad, the Foreign and Commonwealth Office continues to advise against all but essential travel to Cairo, Alexandria, Luxor and Suez. The full travel advice notice can be seen here. It’s hard to believe that it is so long since I last posted on this blog. Unfortunately, I have been very much preoccupied with a raft of other things and postcards went to the bottom of my “To Do” list. Hopefully, I will soon catch up with a pile of postcards which I have to scan and put on Reminiscene. As you may have noticed, Reminiscene has a new logo. The picture is of an anonymously published undivided back postcard of a Gondolier in Venice. 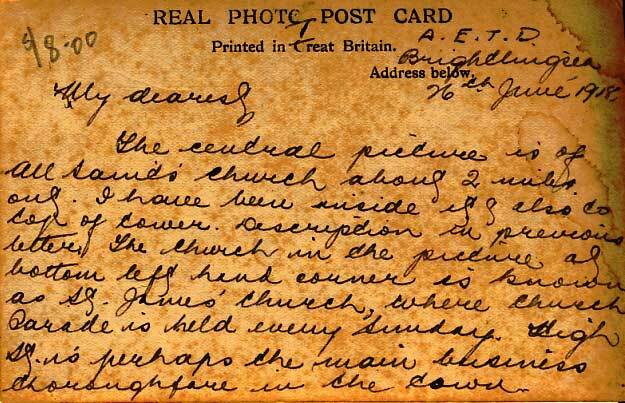 The postcard was postally used on 19 May 1897 and is one of the oldest in my collection. A larger image can be seen here. Here’s hoping that it will not be too long before more postcards (and messages on their backs) materialise. Meanwhile, for those of you who are into tweeting, Reminiscene is also now on Twitter. I am frequently asked if I can value original prints and sketches by Marjorie C Bates. I regret that I am unable to help with this as my interest extends only to postcards bearing her works. Detailed Information about Marjorie C Bates and her works is available from the Panvertu Gallery at http://www.panvertu.com/Bates.htm and http://www.panvertu.com/Bates_prints.htm. Unfortunately, it is evident from the Panvertu Art Gallery’s Valuations page that they, too, are unable to assist with valuations. If you need to value an original painting or print by Marjorie C Bates, I would therefore advise you to contact a local art dealer or auction house who may be able to point you in the right direction. Marjorie C Bates was a prolific artist with 88 of her landmark sketches appearing on postcards published by the British Art Company. I understand that there may be one or two other landmark postcards which do not appear on the list, but I have not yet seen these to be able to verify this. Some of Marjorie C Bates’ sketches of Shakespearean characters have also been published on postcards. Several of Marjore C Bates works reproduced on postcards can be seen on Reminiscene‘s Marjorie C Bates Collection page. It is invariably difficult to pin down the true value of postcards because some buyers will be willing to pay a higher price than others. The bidding frenzy often encountered on internet auction sites can also inflate prices. As a general rule, I would normally expect to pay anything up to £3 for a postcard bearing one of Marjorie Bates’ landmark sketches, and up to £5 for one bearing one of her Shakespearian characters. 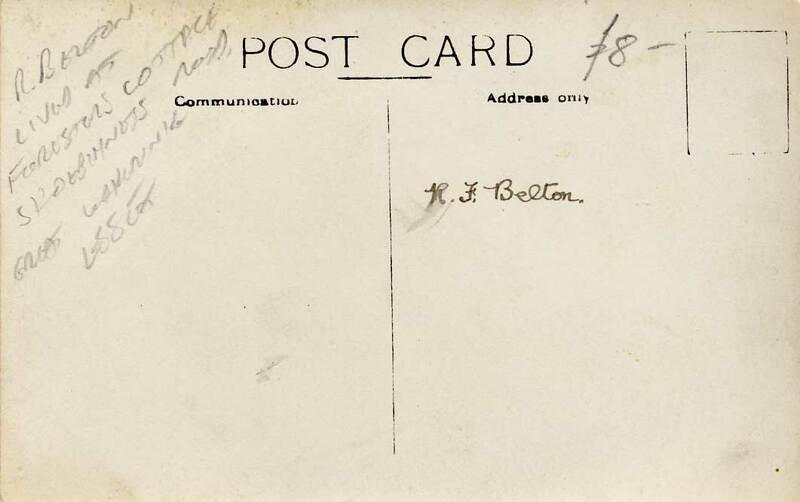 The condition of the postcard will, of course, have a bearing on the price to be paid. Kelvedon and Coggeshall Gas Company float at Coggeshall Carnival in 1930. I have just returned from what I would call a fairly successful day at an antiques centre in Hertfordshire. It never ceases to amaze me, though, what you can find at an auction. Trying to hunt out some more vintage postcards and photographs to put on Reminiscene, I popped into an auction room to browse the numerous lots laid out ready for the dealer’s next auction. Unfortunately for me, I had chosen to enter on a non-viewing day (well, the door was open and the last time I was there it was a viewing day!). Needless to say, I made no attempt to outstay my welcome and promptly left. As I exited, I turned round again to take a last glance at the auction room. There, almost directly in front of me, was an adult-sized coffin which I had failed to notice when I went it. This got me wondering about the circumstances which might lead to a coffin ending up in an auction – especially one which appeared to be in good condition and which, presumably, has not previously been used. All of this begs two questions. Why would somebody buy a coffin and not use it? Will the eventual purchaser get a better deal at the auction than by buying a coffin from a Funeral Director? I don’t suppose I shall ever know. But, I digress. Thankfully, my trip was not wasted. I managed to find what I think is a very good Real Photograph postcard of a barrel organ, and 18 Cabinet Portraits and Cartes de Visite, some of which are named. All of these will appear on Reminiscene soon and I will post again when they are. The central picture is of All Saints Church about two miles out. I have been inside it & also to top of tower. Description in previous letter. The church in the picture at bottom left hand corner is known as St James’ Church, where Church Parade is held every Sunday. High Street is perhaps the main business thoroughfare in the town. There are no prizes for guessing that this postcard is a multiview postcard of Brightlingsea which can be seen here. Here you have a good view of the Hard which I have mentioned when writing to you. The nice hotel you see is the headquarters of the Yachting Club which made this place before the war. On the pebbly beach you see in front of the hotel the Engineers now have their pontoons for bridge-building. The picture on the other side of this postcard may be seen here. 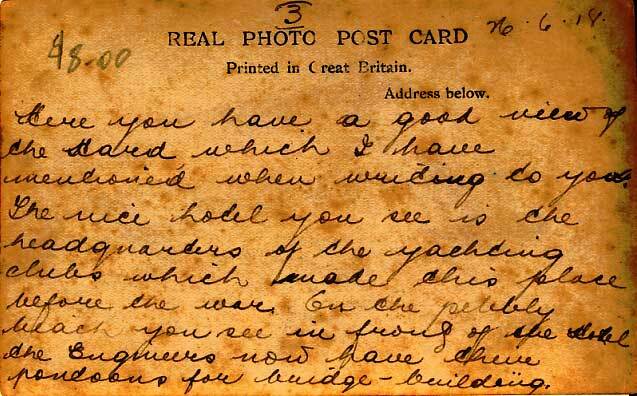 A great shame that I was unable to obtain other postcards in this series as the messages are quite interesting. However, taking air fares into account, these must be the two most expensive postcards in my collection! Perhaps it’s as well that Perth, Western Australia, could offer no more postcards of Brightlingsea, Essex. Just a reminder, if I may. If you enjoy looking at vintage postcards, please check out my website, Reminiscene. You can keep up to date with new additions to the site, and with what is on the other side of the postcards on this blog. Oh, and if you love tweeting as much as vintage postcards, you can always follow me on Twitter. 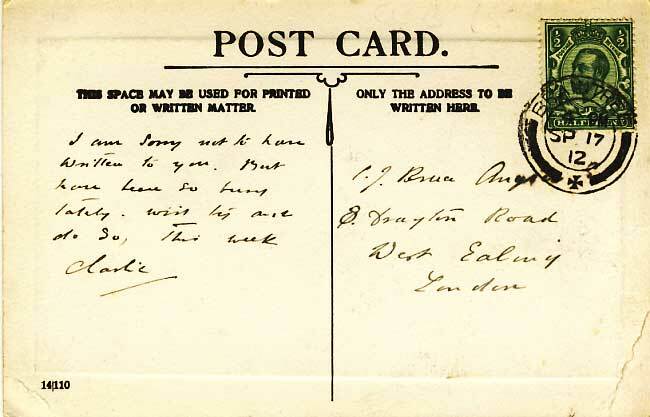 Unfortunately, the surname of the recipient of this postcard is unclear, but whoever he was, he lived at 8 Drayton Road, West Ealing, London. I am sorry not to have written to you. But have been so busy lately. Will try and do this week. The picture on this postcard, which was sent from Braintree on 17 September 1912, is of Great Square, Braintree, Essex and may be seen here.